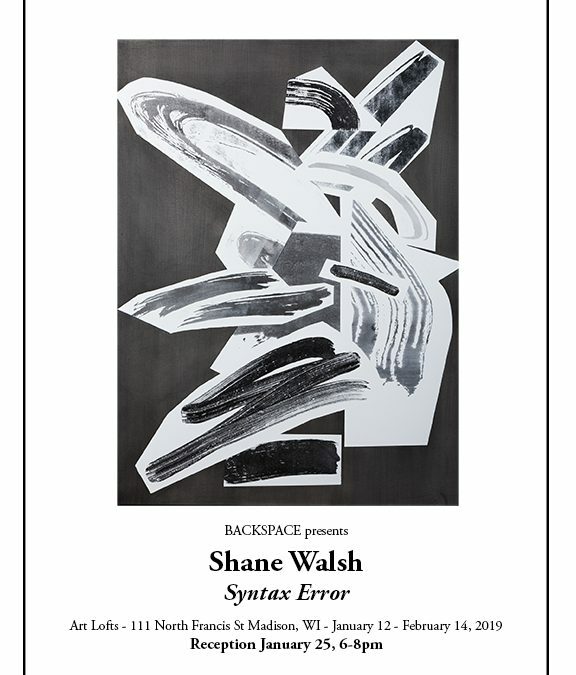 The BACKSPACE gallery would like to invite you to its inaugural exhibition – Shane Walsh’s Syntax Error. Syntax Error is a series of monumental, black and white acrylic paintings. Walsh’s paintings are the result of his involvement with collage, both in a literal sense and as a conceptual framework for understanding the legacy of abstraction. Walsh’s process begins with small-scale collages constructed from photocopies of various shapes and marks – some expressive, others graphic or digital – which respond to the history of abstract painting. Using the collage as source material, he then translates his compositions into large-scale paintings. This overall approach allows him to treat the history of abstraction as a storehouse of moments from which to copy, paste, and sample. This cutting, copying, and pasting, however, owes as much to the punk and hip-hop posters of the artist’s youth as it does to modernist collage traditions. Walsh is an artist that lives and works in Milwaukee, WI. He has exhibited in New York, Miami, Seattle, Portland, and across the state of Wisconsin. Walsh has been featured in New American Paintings and ArtFCity. Currently, Walsh teaches at the University of Wisconsin-Milwaukee.